Amid ongoing claims that the country’s headline growth indicators fail to fully reflect the economic situation in Korea, officials are countering skeptical media reports, in apparent support of President Moon Jae-in’s economic growth initiative. In a press briefing Friday, the Bank of Korea tried to downplay pessimistic views, underlining that South Korea was keeping up its relatively sound growth trend. According to preliminary data from the central bank, the country’s gross domestic product expanded 1 percent in the January-March period this year. The figure, though a rebound from the 0.2 percent on-quarter contraction in the previous quarter, was a slight fall from an earlier estimate of 1.1 percent. This was also the first time since the third quarter of 2016 that the actual growth index was lower than the initial estimate. “Despite the slip, the 1 percent on-quarter increase may be seen as a relatively sound growth trend,” said an official of the BOK’s economic statistics department. Should the nation attain minimum growth of 0.82-0.88 percent from the second quarter, it will have little problem achieving the yearly growth target of 3 percent, the official added. The central bank’s defensive remarks came not only as a pre-emptive response to pessimistic media reports, but also in denial of the negative outlook put forward by major think tanks here. The Korea Development Institute, in its half-year economic outlook report released Thursday, anticipated the country’s GDP growth to be 2.9 percent this year and 2.7 percent next year, inching down from last year’s outcome of 3.1 percent. The key downward factor, according to the KDI, is the sluggish construction investment that is likely to turn negative in the remaining part of the year. These concerns seemed to gain further ground as the BOK explained that the slip in quarterly growth was partly due to lower-than-expected investment in construction and facilities, which fell 1 percentage point and 1.8 percentage points respectively from the April estimate. 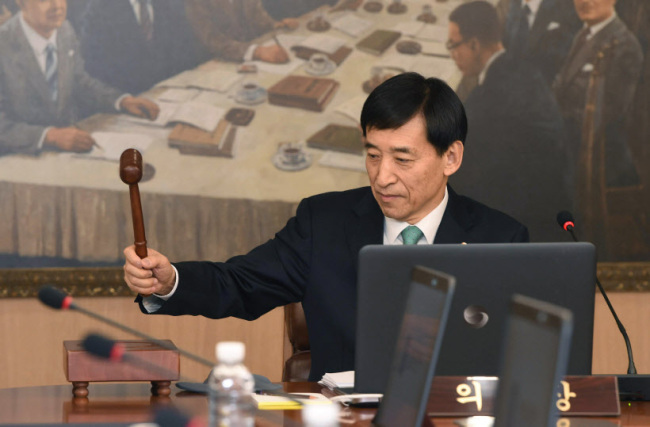 The Ministry of Strategy and Finance also rebutted a media report that claimed that the ministry had exaggerated government assets and downscaled debts, allegedly leading to a margin of error of 4 trillion won ($3.7 billion) or more. “Last year, we attained the lowest number of correction orders from the Board of Audit and Inspection since the introduction of the double-entry bookkeeping system in 2011,” the ministry said in a release. It also added that some of the previous disparity in amount was due to the government reshuffle in 2017, stressing that it had no intention of overstating fiscal indexes. The defensive remarks came amid growing doubts over the country’s macroeconomic indicators as the average household income continued to dwindle despite the upturn in figures. “This means there may be a large gap between macroeconomic indexes and the way the people feel,” President Moon said earlier this week in a meeting with his aides at Cheong Wa Dae.